THERE’S a feeling of a full circle for Springvale-born actor Diana Nguyen as she prepares for her Drum Theatre debut. 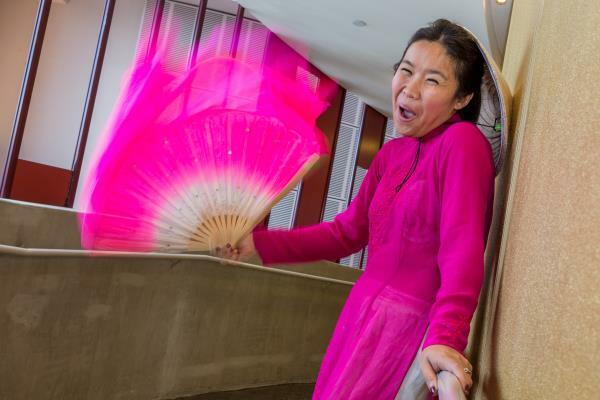 She and long-time friend Fiona Chau finish their final stage-tour of their comedy Phi and Me at the Dandenong theatre this month. “We want to finish with a bang – back where we began,” the exuberant comedian said. It’s the original show – with some pathos added to the slapstick misunderstandings between Vietnamese ‘dragon mum’ (Nguyen) and her Australian-born teenage son (Chau). Nguyen explains that the extra layers was an extension of the actors’ softening views since they first played it for laughs and sold out at Melbourne’s international comedy festivals. “I’m proud of the show. It’s what the original show should have been. She said there was also some poignancy in the recent death of former prime minister Malcolm Fraser, who ushered in thousands of Vietnamese refugees in the 1970s. His death, close to the 40th anniversary of the end of the Vietnam War, was been marked with gratitude by the Vietnamese community, Nguyen said. Phi and Me meanwhile is set to regenerate into an internet-based series – crowd-funded by 65 donors. The plan is to connect these characters to a wider overseas audience. “I would love to keep performing the (stage) show but theatre does take a lot of energy. Phi and Me: We’re Back is at Drum Theatre, 226 Lonsdale Street, Dandenong, on 18 April, 7.30pm. Bookings on 8571 1666 or at drumtheatre.com.au.